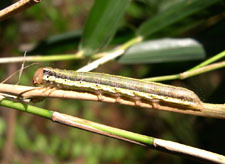 Those of us who get annoyed by white butterfly caterpillars on our cabbages or broccoli may want to spare a thought for pastoral or crop farmers of the late 19th and early 20th century in New Zealand. Some caterpillars were of such plague proportions that on occasion, trains were brought to a screaming (or perhaps more squishy) halt by armies of caterpillars with their sights on a particularly tasty-looking field of wheat or oats. My attention was brought to this fact by my recent reading of Ross Galbreath’s history of the Department of Scientific and Industrial Research (DSIR – Making Science Work for New Zealand). Though it sounds dry, it is in fact an entertaining read, and Galbreath brings depth and colour to many of the interesting characters who feature in the history of this institution. Galbreath, himself an entomologist who worked at DSIR, dedicates a chapter of this book to the efforts of scientists and technicians to combat introduced animal and plant pests with biological control (generally other introduced insects) – often, with somewhat mixed results. 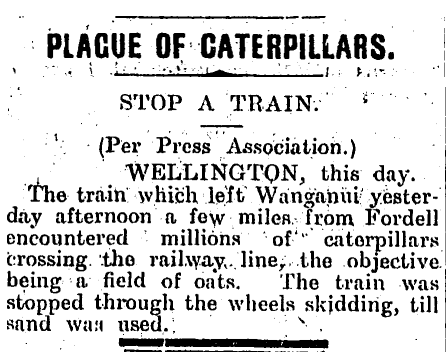 Galbreath opens the chapter with this attention-snatching headline, apparently dating from around 1880, when a train was brought to a halt in the Rangitikei district by a plague of caterpillars crossing the tracks. I could find no reference to this on Papers Past, but did find the following article, from nearby Wanganui, dating from 1910. For anyone interested in the history of applied science in New Zealand, I recommend this book, which dates back to 1998, but I suspect has not attracted the audience it deserves.